Grasslands are the “breadbaskets that feed the world” – no coincidence because many of the crops people eat are grasses, including wheat, rye, oat, corn, millet, sorghum, sugarcane, and rice. Other grasses are used in construction, most commonly sod (think Little House on the Prairie) and bamboo. Since these fertile lands are excellent for growing crops, these areas have been the location for territorial disputes throughout history. The soils under most grasslands are exceptionally rich with nutrients and have dark deep topsoils high in organic matter – because each grass plant can have miles of roots which decompose every year. Grasslands must also adapt to periods of low moisture and to frequent wildfire. 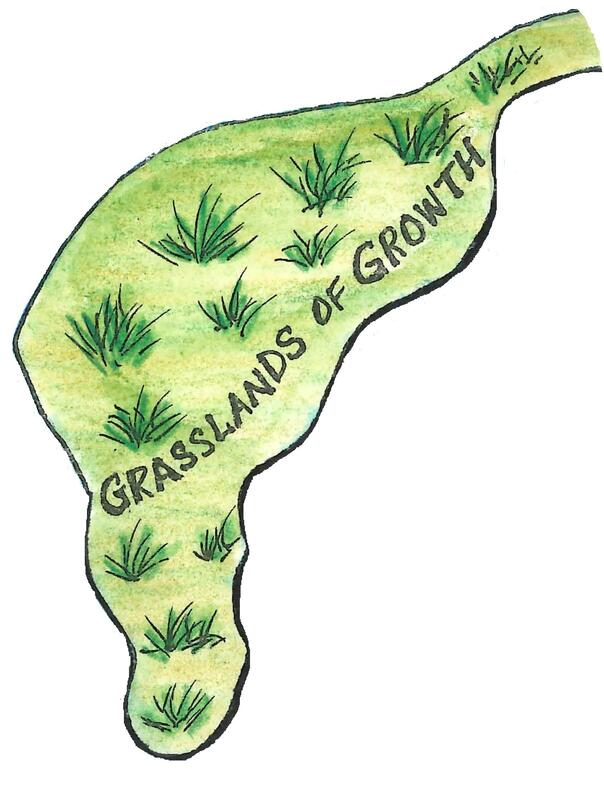 Grasslands of Growth evoke the idea of a fertile place to plant, tend, and reap. Grasslands are often irrigated to promote growth, and fertilized (hopefully organically) to increase production. The Grasslands of Growth are located near the River of Communication and on the shores of the Ocean of Mysteries, two sources of potential nourishment (expression and mystery). What ideas, projects, habits, or wishes would you like to plant in fertile ground? How can you fertilize your grasslands? What elements are needed to fertilize, water, and harvest your crop? Are the things you are planting genuine – or have they been genetically modified (contaminated) from outside sources? What wildfires could potentially devastate your crops? What can you do to protect against these wildfires – or are this fires necessary for growth? What will you build from your harvest? Who will you feed with your harvest? With whom will you share the bounty? How can you increase your harvest? Are you planting just one crop (a monocrop or cash crop) or are you planting a variety of crops (for long term subsistence)? Does your grassland need to lie fallow to regenerate? Which seeds will you gather to ensure future crops?